Getting a qualitative article or book published involves more than simply doing the research, writing it up, and sending it off. You also need to know how to navigate the social relations of presenting your work to the journal editor or book publisher—and how to craft your message to them—if you want to be successful. Written by a highly-respected publisher of qualitative research, this brief, practical resource shows you how to identify the right home for your work. It also guides you through the publications process-- from crafting the abstract to writing, production, and marketing--once you’ve found the best publisher. The author -demystifies what publishers and journal editors do, how they make their decisions on qualitative articles, research studies, and methods books;-discusses edited books, how to publish from your dissertation, and when to consider open access and electronic publications; and-includes case studies, appendixes, forms, and resources to help the aspiring academic. 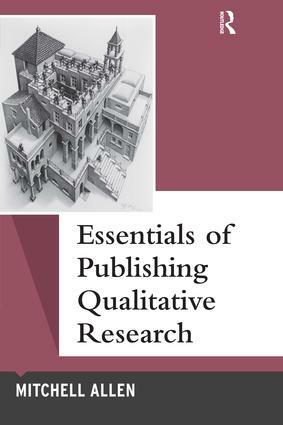 "As a new scholar trying to better understand the norms of qualitative publishing to develop a successful publication record, I found the directives in this book incredibly practical, applicable, and even a bit entertaining." "Reveals a behind-the-scenes look at publishing while providing a fun and pragmatic field guide to getting qualitative work published from articles to academic books." Qualitative Essentials is a books series providing a comprehensive but succinct overview of topics in qualitative inquiry. These books will fill an important niche in qualitative methods for students--and others new to qualitative research--who require rapid but complete perspective on specific methods, strategies, and important topics. Written by leaders in qualitative inquiry, alone or in combination, these books will be an excellent resource for instructors and students from all disciplines.